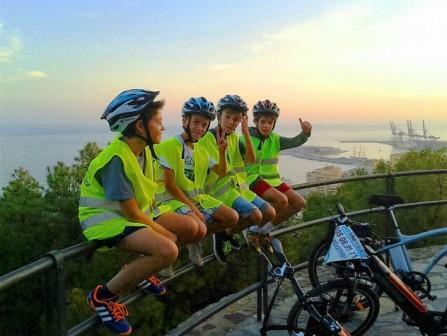 Interactive guided tour to explore Malaga with an electric bike, little effort and funny way to enjoy the best views! A funny guided tour to discover and learn about the city centre of Málaga riding an electric bike (e-bike), where the expert guide tour will explain you the history of the most important monuments that line this legendary route. After this, you will experience the amazing views of the city and bay of Malaga from Gibralfaro hill Balcony easily and without being tired! The e-bike will allow you to go up a hill without effort! You will continue going down through the Alcazaba fort to the seafront promenade...the sun and the sea will show the beautiful sights of the charming Balneario, where the small group tour can relax and drink something before coming back to the pier, "Muelle Uno" and "Palmeral del las Sorpresas". We believe the sightseeing tour of the city we offer you is perfect ! Historic, trivial, and playful. Kids are welcome! Recommended over 8-10 years of age always accompanied by a responsible adult and height/weight over the limit restrictions. E-Bike Malaga will notify you if there is no availability at the time that you selected and propose a different one. If you don't feel comfortable with any of the proposed times, you can cancel your booking at that moment indicating so to E-Bike Malaga and obtain a full refund.